Probably, you hear Content is king in SEO strategies to high rank. But have you ever written a piece of long content more than 5000, if haven’t then you don’t conscious the benefit of long content, but if you have then you know how much significant is it and it indeed lots of work. If you are looking to start-up business but have fear of every day of failure then you need to get anything for your business advice. That is the benefit of creating informative and long form content. 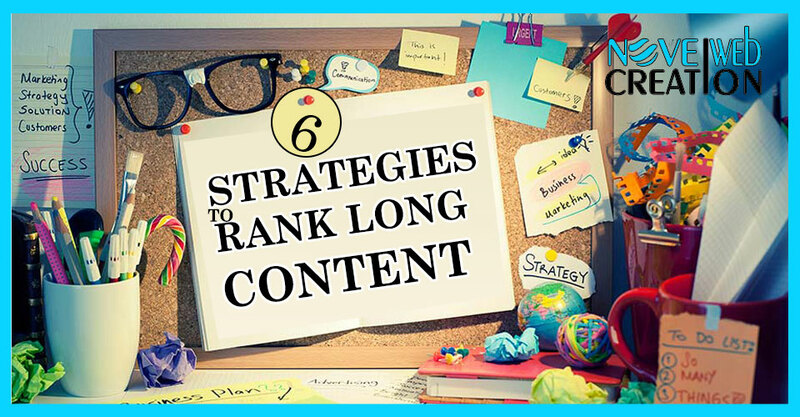 Long form content will get you more visibility, improved engagement and social shares, more backlinks and most of all; it will make your audience start seeing you as the ultimate authority in your industry. Here we come to the point of the SEO strategies for ranking. Start with Keyword Research: – Before writing a post, you should focus on best search keyword with fewer competitors. Just ensure that you are searching write keyword because it determines the success of your keyword in search engine. There are many amazing keywords on the internet that will help search keyword. Some of are given. Target Long Tail Keyword: – Focus on the long tail keyword is more significant than writing long content. but lots of the people don’t conscious that they should target long tail keyword than long post to get draw more traffic and easier search. Optimize and clean your URL: – Clean URL and short link help to understand Google search what your post is about. Also, you want to ensure your URL contains your target keyword; this will enable it to rank better. Use Proper H1 Tag: – Every page should be proper H1 Tag that makes user clear about page title. A good and Proper H1 tag use impact search engine result page. Provide clear idea about your post. Have a long tail keyword. Add Inbound link: – Inbound on the website is referred any link from a page of a website that point another page on the same site. Add Outbound Links:- Outbound link refer that linking out to related pages in your niche tells Google that your page is of higher quality; it also helps search engines figure out your exact topic.